Hall of the Mountain King: Review: Hank III, "Straight to Hell"
Review: Hank III, "Straight to Hell"
After putting out two fairly sanitized and safe records, someone finally decided to let Hank Williams III do what he does best. The result is his latest album, "Straight to Hell," a collection of rabble-rousing, hell-raising, old school country tunes, many of which he's been playing in his live shows for years. The music on this record owes more to his grandfather's honky tonk style, but the attitude comes from the rebellious streak in his father's country rock. 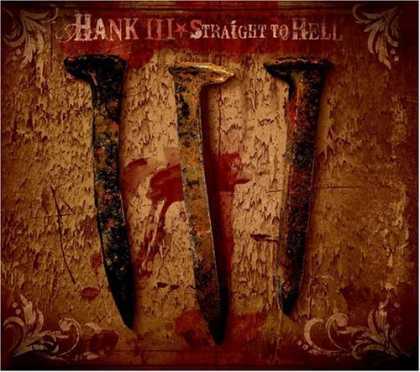 Of course, Hank III has to be louder and more obnoxious than either of his forebears. That's not necessarily a bad thing, though. The best numbers on this album are the uptempo, rockabilly-style partying tunes, such as the title track, "Smoke and Wine" and the infectious "Thrown Out of the Bar." But III does show that he's not a one-trick pony, taking a dark turn on one of the strongest songs on the album, "Country Heroes." The song pays tribute to country legends George Jones, David Allan Coe, Waylon Jennings, Merle Haggard, Hank Sr. and Johnny Cash. It's an eerie number that stays with the listener longer than many of the other songs here. Williams has a great reverence for old-school outlaw country and is outspoken in his dislike of the current country scene, which he calls "pop country." That thread runs throughout the album in songs like "Not Everybody Likes Us," where he sings about crossover artist and friend of Hank Jr., Kid Rock. "Just so you know/so it's set in stone/Kid Rock don't come from where I come from," III sings. "It's true he's a Yank/ he ain't no son of Hank/ and if you thought so, (expletive) you're (expletive) dumb." He also drives the point home, pulling out a favorite live tune with an unprintable name that states in no uncertain terms his disdain for pop country. Fans will know the song. Unlike his previous two records, "Straight to Hell" will probably make some country music fans cringe with the language, attitude and drug references (the parental advisory sticker is well earned). But it's par for the course for III, whose live shows include a set of country and a set of punk and metal and who spends his spare time playing bass for New Orleans metal band Superjoint Ritual. Love him or hate him, III probably embodies the outlaw spirit more than any other singer out there today. If you love him, that's great. If you hate him, well, he just doesn't give a damn.